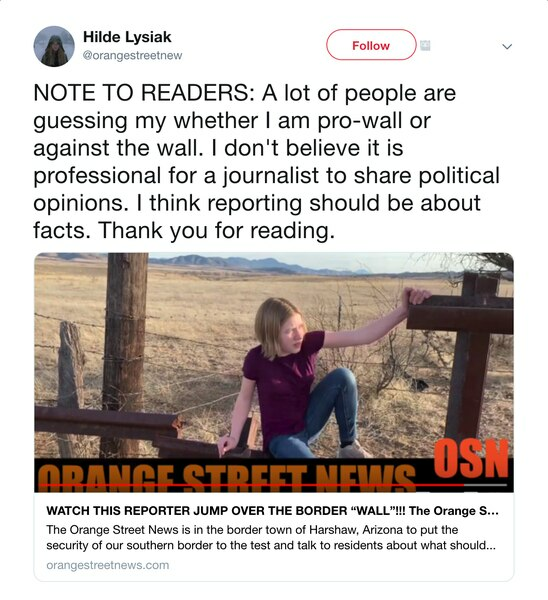 Hilde Lysiak, the preteen journalist whose exploits have inspired a Scholastic book series and an upcoming TV show, made a name for herself in 2016 by being the first to report on a grisly murder in her hometown, then firing back at critics who suggested that a 9-year-old girl shouldn’t be hanging around crime scenes. Since then, she has continued to break news about bank robberies, alleged rapes and other lurid crimes in the Orange Street News, the paper she publishes out of her parents’ home in Selinsgrove, Penn. So naturally, she didn’t back down when Joseph Patterson, the town marshal in Patagonia, Ariz., allegedly threatened to throw her in juvenile jail on Monday, then falsely claimed it would be illegal for her to film him and publish the video on the internet. Instead, she posted their exchange on YouTube and in the Orange Street News — which in turn prompted town officials to discipline Patterson, as the Nogales (Arizona) International newspaper was the first to report on Wednesday. She also broke the news on Feb. 14 that one resident had spotted a mountain lion roaming around Patagonia, a town of fewer than 1,000 people nestled in the foothills of the Santa Rita Mountains. That evidently irked Patterson, who "took exception" to her attempts to chase down the story, the International reported. "We're trying to keep people away from there," he told the paper on Tuesday when asked about the sighting. In the Orange Street News, Lysiak wrote that she was riding her bike to investigate a tip about 1:30 p.m. Monday when Patterson, whose position in the small town is equivalent to that of a police chief, stopped her and asked for identification. The 12-year-old gave her name and phone number and mentioned that she was a member of the media. She said Patterson told her, “I don’t want to hear about any of that freedom-of-the-press stuff” and added that he would have her arrested and thrown in juvenile jail. Barr added: "Hilde is a force of nature. One can only imagine what she what sort of stories she will be turning out once she has a driver's license."